You are going to like the long handle for paring and yes, they are very easy to remove and reinstall. Just grab the chisel by the socket and then tap the end of the handle against your bench top, at an angle (about 45 degrees to the bench top) exerting side pressure on the handle. A couple of light taps should do it. Then reinstall by firmly grabbing the chisel portion around the socket and hitting the handle straight down (90 degrees to the bench top) against the end of the handle very firmly. Again two to three firm taps should do it. E.A. Berg is (was) a Swedish company & their chisels are of exceptionally high quality. AFAIK they made chisels for some other European brands, like Nooitgedagt in the Netherlands — so you may want to include those in your search parameters. I did order a selection of LN chisels and 1 long handle. I later visited Highland Woodworking and handled a couple of Blue Spruce chisels. My impression is that the LN chisels are excellent general purpose tools. The Blue Spruce chisels feel much smaller and, perhaps, better for finesse work. I subsequently ordered a few Blue Spruce chisels. It will be fun trying them back to back although I don’t know if I want to hammer on the Blue Spruce chisels. They are too pretty. The Blue Spruce mallet is superb. I ordered the Blue Spruce round mallet. Is that the one you recommend? You guys are costing me money! I was not aware of Blue Spruce Tools until today. I have an e-mail question out to them. I have a feeling the answer is going to cost me. I bought a Ramelson mallet for $35 or so at a local Woodcraft store. It works for me. And the rock maple is still slightly softer than hornbeam. I am spending a lot of money on nice hand tools. I’m also watching a lot of videos on using hand tools. There must be thousands of YouTube videos on the best way to do dovetails! There is a possibility that my wife and I will move out of our rather too big home into a retirement community. There, I probably won’t have room for my too large collection of big power tools. So, I’m learning to do woodworking with hand tools. Except for hammering out dovetails, this mode of woodworking is much quieter. It’s certainly full of challenges. The next challenge will be how to divest my dearly beloved power tools. I have added to the collection since, but here is a nice picture. I’ve looked at the Japanese chisels. I noticed the backs are concave except for maybe 1/2” behind the cutting edge. After the chisels have been sharpened many times, the concave surface would affect the cutting edge. In my experience a Japanese chisel would only be touched up on the back and at the tip of the bevel or microbevel. If you are doing a full regrind of the bevel often then Japanese chisels may not be for you. @Runhard - Do you have a way to contact Dave at Blue Spruce. I have sent a note through their website but I have not heard anything back. @Alanbach pm sent with email address and phone number. Yes. Been very happy with mine. I have purchased the Blue Spruce Bench Chisels primarily because of the wonderful handles. Dave is certainly an artist with wood. Mine are all fitted with the African Blackwood, which is very hard. The steel is A2, which is identical to the LN steel, and I could see an advantage to being able to switch to a longer handle, but I can't get enough of the African Blackwood, which is also available on other Blue Spruce tools, Including the handle that came with the round mallet I purchased. I did mean sweedish, not swiss, just a typo. my bad. indeed sweedish steel was popular for its quality, while the town of Eskilstuna seemed to have the best blacksmiths. only thing is that E.A.Berg didnt make much socket types (they exist, just very rare) and they're mostly on the shorter side of bench chisels, while lately i've bin picking up a few longer socket paring chisels made by Jernbolaget (also Eskilstuna sweeden) arguably same superb steel as Bergs, just more of a style that I like. that's no big deal, Japanese makers slightly hollowed their chisels backs just so it would be easier to flatten, if you sharpen it back far enough towards the hollow, you would just need to flatten it down a bit more, and all is good again. they would get up in the morning, grab all their tools (chisels/planes) and touch them up on their water stones before the work day every day, both, back and bevels. just a quick touch up and its good for the day, all sharpening was done by hand, no power grinders. Blacksmiths hollowed backs as a feature just to save some time for sharpenings later, and touching their tools up daily also kept them from going completely dull. they're also the ones that designed a simple block with a slot cut out, a wire pin stuck thru it across, and a blade with a chip breaker. you adjust the depth and blade position by lightly tapping on the wood body in/out and sides for alignment. then they called it a PULL TYPE PLANE. simple yet effective, they still produce the finest shavings today. Thanks for the explanation on the Japanese chisels. I think I have bought all the chisels I can justify to my wife. The LN chisels arrive UPS Wednesday and I’ll give them a go and post a report. I have no idea when the Blue Spruce chisels will arrive. I’ve been “learning” dovetails for the past week or so on scrap. Yesterday, I got the first joint with 2 dovetails to lock into place with the board sides perfectly aligned. I had a tiny gap on one side of a dovetail that I caused when I was adjusting the fit with a rasp. I’ve been doing woodworking for many years and built some really nice stuff, but this simple dovetail joint was surprisingly pleasing to me. All this makes me even more appreciate the artistry and skill of the craftsmen who cut multiple flawless dovetailed creations. I had no idea that @derekcohen was a registered user on this forum. For those not in the know, this man has an epic woodworking hand tool internet presence. Big fan of the In The Woodshop website, right here. My box of LN chisels arrived today. I only had time to unwrap one before I had to drive to the airport. That one is beautiful! The quality is like that of their planes.... first rate. I can’t wait to use them. The Blue Spruce chisels are supposed to arrive Wednesday. Thanks YH. You are very kind. As I predicted six days ago you guys have cost me. My new Blue Spruce Toolworks mallets arrived today and I am stoked!Thanks again to Runhard for the referral and to others here that helped to introduce me to BLue Spruce. Those look really nice. I’m glad that I was able to be of assistance! Those are beautiful. What are the advantages of the round mallet vs the block mallet? Generally I would say finesse vs. brute force. Also I often use a round mallet with chisels that do not have flat ends (with a ring). A round mallet will direct force where your other hand leads the chisel regardless of the precision with which you strike onto the chisel. The larger rectangular mallet will probably be used less and mostly for bigger chopping jobs like larger, deeper mortises, etc.. The larger rectangular mallet also has one mar resistant face to tap things into place with. Lastly, I tend to be somewhat obsessed with things that feel like complete sets to me so there you go. 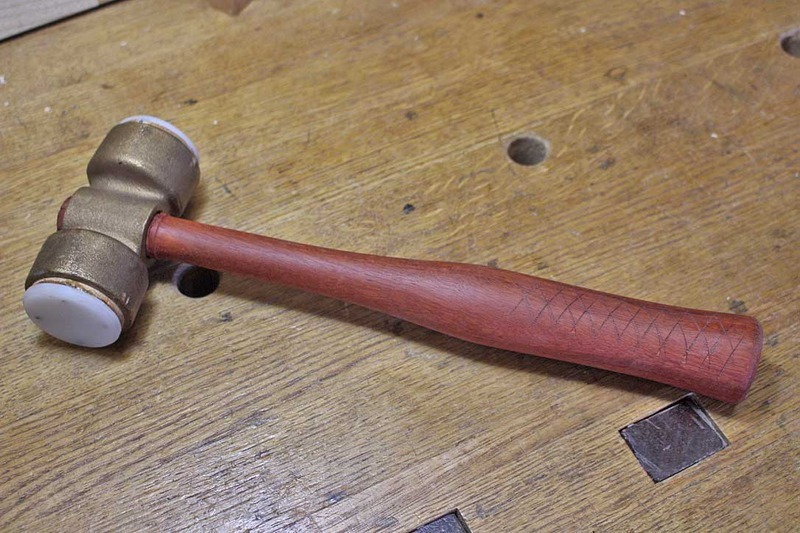 I forgot to add that traditionally the round mallet would be considered a carver’s mallet and the larger rectangular mallet with its angled faces would be more of a joiner’s mallet for big chopping and assembly of larger joinery. Thanks for the mallet info. Glad I ordered the round one. I’ve been using a small hammer with a plastic disk on one side and a brass disk on the other side. The fancy wood Blue Spruce mallet certainly will “Spruce Up” my workshop. Those are gorgeous, what sort of wood is the handle of the square mallet? Both handles are Cocobolo. Both heads are figured hard maple.